A Green Heron continues to hunt along the edges of the swampy pond in our backyard. Today, Oct. 23, is its seventh daily visit in the past eight days. The bird will be a late migrant when it decides to give up its seat at this table. 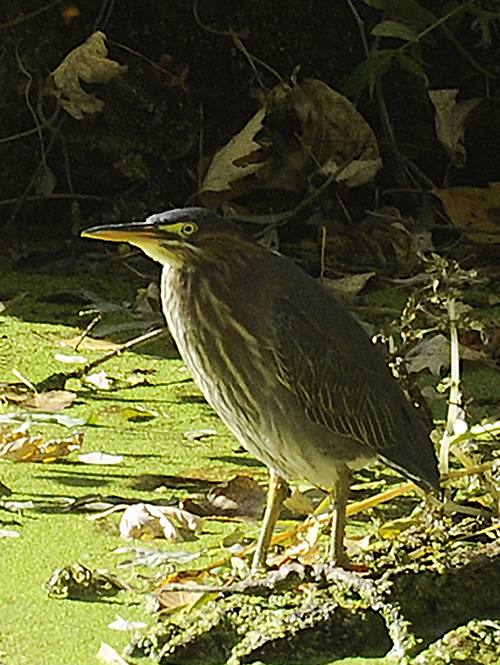 The eBird email alert for noteworthy birds recently seen here listed a Green Heron (not this one) two days ago. The upcomlng colder and wetter weather probably will put the heron on its way south. I like Green Herons. It's been fun to have such extended viewing. Minnesota’s breeding bird survey reports the species has been seen in 81 of our 87 counties, with breeding evidence documented in 38. It is most common in the central part of the state. Northern populations of this species migrate in the fall, and that probably includes the bird in the photos. Mid-October is given as late migration timing, but these days historic records might not mean much. The birds spend winter months along the Gulf and southern ocean coasts and in Mexico and Central America. The photo was taken yesterday. Concerned about its recent heavy eating habit, the bird wants to know if you think it looks fat.